Imagine Your Life in when living in Denver, Colorado! Imagine Life in Denver, Colorado! What comes to mind when you think of Denver, Colorado? Do you think of blue skies and distant views of the Rockies? Can you imagine what life would be like living in a modern Western city? Lower Than Average Unemployment = JOBS! Denver boasts a lower unemployment rate than the national average for comparably-sized cities. In early 2016 — which is when U.S. News and World Reports did their research — Denver’s unemployment rate was 3.1%, which was well below the national average of 4.9% at the time. Since then, it’s dropped even lower, and as of September of 2017, Denver boasted an unemployment rate of just 2.2%! But the best part is that not only are there jobs aplenty in Denver, but they tend to be high-paying jobs as well — averaging around $5,000 higher than the national average of $47,230. That’s thanks in part to the growing cannibis industry, but there are also high-paying opportunities in fields like aerospace, biotech, healthcare and hospitality, to name a few. Looking for Just the Right Spot to Live? You’ve Found it in Stapleton! If big city access — rather than living — is your thing, you definitely need to give nearby Stapleton a close look. Diversely populated by people who work in Denver-proper, Stapleton offers a variety of distinct neighborhoods with names like Bluff Lake, Wicker Park and Eastbridge, to name a few, you’ll find an eclectic mix of growing families, young professionals, empty nesters and community minded people everywhere you look. 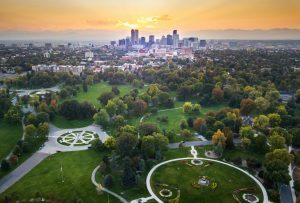 The city also abounds in great schools, rating above average, with Denver 1 school district rating a perfect 10 and Denver County 1 school district rating a near-perfect score of 9, according to research by Zillow. There are also several colleges in Denver, including the University of Denver and the University of Colorado at Denver, both of which appear on U.S. News and World Reports’ ranking of the best colleges in the country. Yes, Denver has snowy winters, but it also has a pretty high percentage of blue-skied sunny days — nearly 70%, according to the National Oceanic and Atmospheric Association (NOAA)! Whether you like laid-back barbecue, trendy Asian cuisine, or just love a good all-American steak, you’ll find restaurants galore in Denver, Colorado. Summers are teeming with music festivals, and you can picnic, run and play in beautiful Washington park. Love to gamble and feast on buffets? Just hit I-70W for about 30 miles, and you’ll find towns like Blackhawk and Central City, where gambling is legal and buffets abound! Do you live for sports? Don’t forget that Denver’s the home of the Denver Broncos and the Denver Nuggets! Looking for a Great Spot to Live Near Downtown Denver? Just 15 minutes east of the downtown, you’ll find Stapleton, a diversely populated development of great neighborhoods and shops that about 25,000 “Denverites” call home! With 1,100 acres of open space, you’ll get the best of both worlds — close proximity to the city and all it has to offer plus lots of natural beauty, too! Choose from single-family homes, condos or apartments, and enjoy good schools, lots of green space, and the privilege of living close to Bluff Lake Nature Center, one of the country’s largest urban wildlife refuges! Here’s another neat fact about Stapleton: It gained national recognition in 2011 when it became the site of HGTV’s “Dream Home” for that year! As you can imagine, HGTV is pretty particular about the sites they choose, insisting on plenty of beautiful scenery and a great sense of community. They called Stapleton a young, visionary community, and you couldn’t ask for a better compliment! You may not be in the market for anything as grand as an HGTV Dream Home, but the pros at Dyllan Real Estate can help you find the home in Stapleton near Denver, Colorado that’s perfect for you and your family!